Ideal Pet Products has been on the cutting edge of high quality pet door design and manufacturing since 1979. Our goal is to provide freedom, care and protection to your four-legged family members – from the most frolicsome feline to the most playful pup! Your piece of mind is our top priority, and that comes with knowing that your pets are safe and comfortable. To back up our confidence in our Ideal Pet dog doors and cat doors, we offer a One Year Warranty in workmanship and materials. Our commitment to high quality pet supplies goes hand in hand with our commitment to the environment. 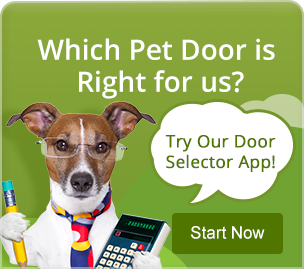 As a company, we help to conserve our nation’s natural resources by designing energy saving dog doors and cat doors that fit your family’s needs and budget. We're proud of our pet door products and our commitment to delivering durable, superior dog doors and cat doors for your home. Our selection of over 200 pet doors and pet product replacement parts have been hand-crafted and uniquely manufactured to fit your family's and pet's needs.